This huge desktop printing calculator is a sibbling of the neat TI-5220 based one the earlier TI-5040. Dismantling the TI-5225 reveals some known components and a typical Texas Instruments construction. 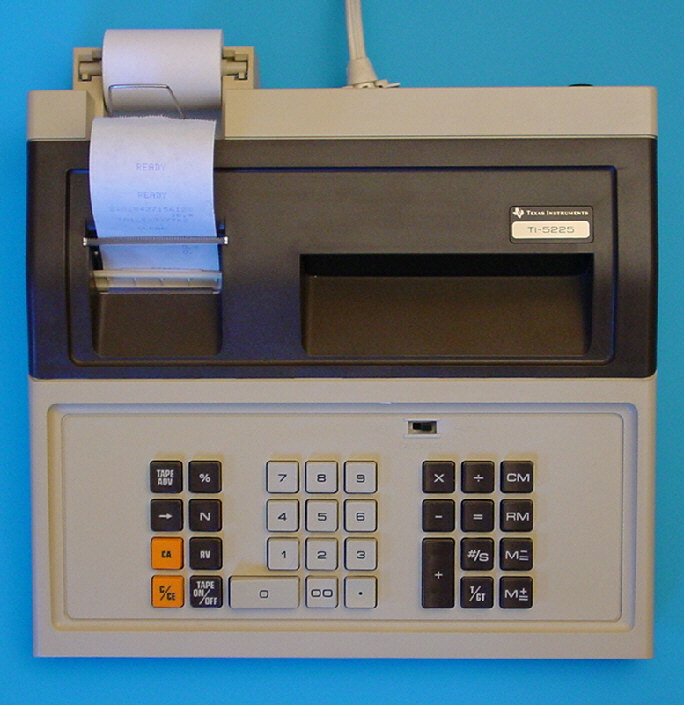 The keyboard module is similiar to the TI-3500 introduced already in 1972 and the printer is borrowed from the PC-100 printing cradle sold together with the SR-52. The printed circuit board (PCB) makes use of two enhanced devices of the famous TMS1000 Microcomputer family. We know similiar chips already from the related TI-5220, a sibbling of the TI-5040. PC-100 printing cradle sold together with the SR-52 and the TMC0261 of the TI-5040. An enhanced version of the TI-5225 was introduced with the odd TI-5230. © Joerg Woerner, November 17, 2003. No reprints without written permission.